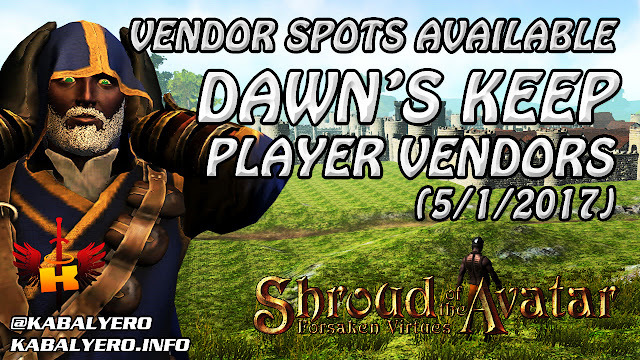 Dawn's Keep, Vendor Spots Available (5/1/2017) 💰 Shroud Of The Avatar (Market Watch) - KABALYERO - PLAY, BLOG & EARN! It has been two months since I last visited and I was surprised to see how the town has changed. There are now more available spots at the entrance. I guess the old houses or lots has expired and were automatically unclaimed. Anyway, there are still a few Player Vendors in Dawn's Keep and you can check them out by watching the video below.